What to Wear – Clothing should be flexible, non-binding, and breathable, we keep the yoga room in the lower 70s to mid 80s — avoid wearing heavy sweatpants, etc. Shorts or leggings, and a t-shirt or tank top are popular choices. Avoid socks and baggy clothes. When to Eat or NOT Eat – Practice is best on an empty stomach. Wait a minimum three to four hours after a large meal or one to two hours after a snack. What do I need – Equipment – A yoga mat. I have spare mats here for your use and yoga mats for sale. Perspiration – Yoga is the “Art of Work”, meaning to act with ever increasing efficiency and intelligence. However, one should be prepared to sweat. Being “warmed up” is the best protection against injury, and it is the heat that helps the body move the toxins from our organs to our bloodstream where we can get rid of them. Do not wipe the sweat off with a towel or cloth, ENJOY IT! As our body releases sweat, not only are toxins excreted, but also beneficial minerals and hormones. As we practice some of these minerals are rubbed back into the skin. Sweat also produces a natural antibiotic, dermicidin, which helps to kill bacteria on the skin. New/Full Moon – Traditionally no asana (posture) practice is done on new and full moon days. It is believed the moon affects the body much as it affects the tides (our bodies are 70% water.) and we are therefore at a higher risk of injury during these times. A softer practice or a meditative practice is appropriate for these days. This can help one not to be too attached to practice and routine. It also provides time for rest and recuperation. The Menstrual Cycle – Resting during menstrual flow is best, this is not the time to practice a full Ashtanga series. This is a restorative time for the body. Postures like Janu Sirsasana A, Baddha Konasana, Balasana, and Upavishta Konasana relieve pain around the sacrum and hips as well as menstrual cramps. Modifying your practice to a soft meditative practice that includes deep breathing to calm the mind is recommended. Pregnancy – Yoga practice is beneficial during pregnancy, and can ease many of the discomforts involved. However, one should only continue an ashtanga practice through pregnancy if you had been practicing consistently prior to conceiving. New students should attend special prenatal yoga classes. Experienced students should not try new, challenging, or precarious postures which might endanger mother or fetus. It is a common sense matter. 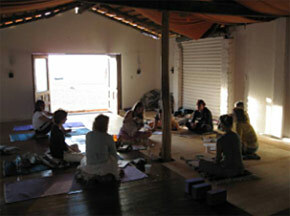 Therapeutic Applications – Yoga is naturally therapeutic and generates excellent health. The use of yoga for specific problems is advisable but should be done with a teacher’s guidance. Soreness – A pleasant soreness in the bellies of some muscles is not uncommon, especially if you are progressing with an intelligent enthusiasm. This is good. Pain in the joints is an indication of pushing or poor form and alignment. In this case one must pull back and study the posture more closely. Consultation with a teacher is always advisable. Cleanliness – Heat increases odor. If you have had a stressful day, your body releases hormones that cause odor. Sweat from working-in (yoga is a work in, not a work out) does not cause odor, it is the heat in the body that is accentuating the odor that was already there. Showering before yoga is appreciated. NO PERFUMES OR SCENTED LOTIONS IN CLASS PLEASE. Heat increases these scents as well and many people suffer allergic type reactions to perfumes. There are days when time is short and we have less time to practice. What should we do? Not only are there days, but sometimes longer periods when a shorter practice is required. Which are the most important elements? The most important elements are surya namaskar and the last three postures – yoga mudra, padmasana and ut pluthi. If you only have 15 minutes to spare – these four elements can give a deep and refreshing visit to your yoga practice. A little bit of practice everyday supports us much better than a longer more intense practice once or twice a week. If you have less time, still do something! While taking a shorter practice focus more intently on mula bandha, especially in the padmasana positions. If you have 30 minutes, you can add the standing and/or finishing postures. 10 minutes suryanamaskar, 5-10 minutes standing (6 fundamental asanas or full standing series), 5-10 minutes finishing – 5 minutes rest. If you have 45 minutes you can add half a series. Always start with suryanamskar and finish with padmasana – then add either standing or finishing depending on your need. Once standing and finishing postures have been added, next add a half or full series. If you consistently only have 45 minutes and previously practiced a full series or more, you can alternate which half of the series you practice – ie on day one you practice the first half of primary and day two the second half (from Bhujapidasana) – and so on. Don’t forget to rest after practice! If you want to integrate what you have experienced during yoga practice, you have to lie still for a few moments – at least until the heart rate has dropped and the breathing relaxed. A good sign is that the breath is moving easily in both nostrils – ie shushumna breathing. During the first few years of practice I recommend trying for at least 10 minutes rest. It is almost always better to practice when you are sick or injured in an adapted way (unless you have a fever or severe GI distress). Yoga helps both the body and the mind – the mind should not be neglected even if the body does not feel as fit as usual. Even simple stretching and breathing can bring a great deal of relief when sick. Practice will usually reduce the duration and symptoms of illness and helps to rehabilitate the body after injury. Extended bed rest is usually not helpful. Many people don’t want to practice because they have colds and can not breathe – an extended hot shower before practice will help to clean out the nose. If you are coughing and sneezing, better to practice at home – but do something! Once the body warms up, breathing comes more easily. Try at least 4-5 suryanamaskar A – usually the sinus will clear by that time – try to breathe smoothly and slowly without extra effort – if you strain too much while trying to breathe it will have a counter productive effect. Two excellent practices, which can be as deep and powerful as a short asana practice are Nauli and Agni Sara. These two are a great addition to a regular asana practice which Guruji used to teach in the old days – in fact they are praised as the most excellent of hatha yoga practices in the Hatha Yoga Pradipika – and I would concur, having practiced them daily for over 20 years. May all Beings everywhere be happy and prosperous.